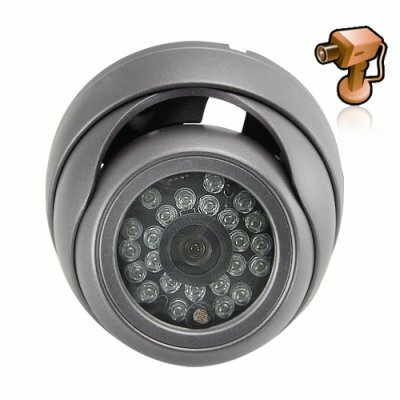 Successfully Added Security Camera Vandalproof Dome (CCD, 24 IR, Waterproof) to your Shopping Cart. Security Camera Vandalproof Dome with 24 IR lights for great night vision and a 1/3 Inch SHARP CCD image device for great quality color image capturing. This model CCTV surveillance camera includes a high quality 1/3 Inch SHARP CCD image sensor, includes manual aiming adjustment, and includes 24 infrared LED's with auto ON/OFF light detection to support night vision. This video surveillance camera is the perfect choice for small businesses, security conscience homeowners, and anyone needing a 24/7 (24 hours, 7 days a week) video feed. The housing itself is a vandalproof die-cast metal dome that will swivel side to side and up and down, so aiming the camera to the perfect angle is very easy. This model is also waterproof and is suitable for outdoor and indoor uses. Reliable CCTV security at an affordable factory direct China Wholesale Price and our famous one year quality warranty, order yours today and we will ship it out tomorrow! This product uses the NTSC color system. If you need a PAL version then please order JKC-910PD-PAL.